The Tarantula Nebula, with its ionizing cluster 30 Doradus, is the nearest starburst in the Local Group, and offers us the rare opportunity to investigate the process of star formation in an environment that resembles in metallicity, dust content, and star formation rate, the extreme conditions of the early universe. Since it is a multistage star-forming region, where loose associations and very dense clusters of different ages coexist, the Tarantula Nebula is a noteworthy window in which to study the different modes of star formations and their reciprocal interaction. The size of the Tarantula Nebula is comparable to active star-forming regions observed in the high-redshift galaxies. Thus, by dissecting its stellar populations and inferring an accurate description of its anatomy, we can reconstruct for the first time the temporal evolution of prototypical starburst on a sub-parsec scale. 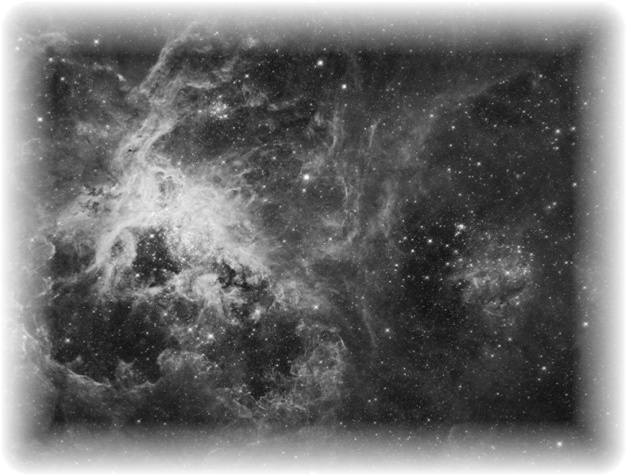 The Hubble Tarantula Treasury Project is taking advantage of the full power of HST to study the entire Tarantula Nebula in the near UV (WFC3/UVIS F275W and F336W), optical (ACS/WFC F555W and F658N) and near IR (WFC3/IR F110W and F160W) . The survey has been designed to cover the same area (14‘x12’) observed by Lennon and collaborators (GO-12499) in the ACS+UVIS filter F775W, to measure first-epoch proper motions of candidate runaway stars. All images in the site are from the Hubble Site and credit should be given to NASA, ESA and D. Lennon. Site designed by Elena Sabbi using a template from Empire Elements, and is contributed to www.openwebdesign.org. The website has been designed using iWeb.